Adherence reports self-generated by bowel surgery patients through an engagement and care management app strongly agreed with those recorded more traditionally by clinical auditors, according to a study recently published in . In addition, researchers from the McGill University Health Centre noted that 89 percent of study patients in an enhanced recovery program (ERP) who used the app believed that it helped them meet daily recovery goals, with 76 percent reporting that the approach increased their motivation to recover following the surgery. For their single-group pilot study, the researchers enrolled 45 adult patients scheduled for elective bowel surgery at their center. Each was enrolled in an ERP with a targeted three-day length of stay, which includes multidisciplinary counseling at the preoperative clinic and daily recovery milestones. The researchers also provided each patient with a tablet loaded an engagement platform developed by . 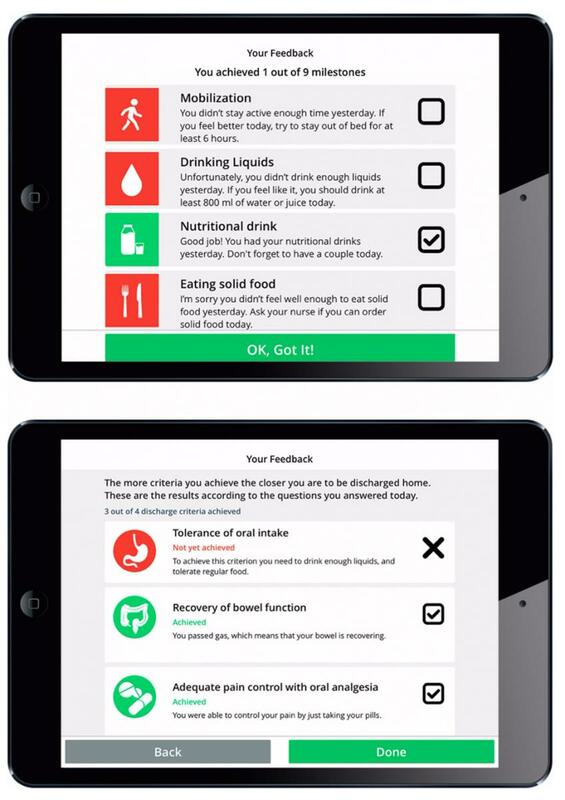 This app included reminders of daily recovery milestones and encouragement to complete them, questionnaires to track adherence to ERP processes and track PROs, and relevant educational materials. The researchers gauged the effectiveness of the approach by measuring the agreement rate between patients’ self-reported data with those collected by a clinical auditor. Following analysis, the researchers deemed fourteen of the fifteen ERP care processes as in “almost perfect,” “good,” or “substantial” agreement with the exception of pain reports with oral analgesia. Absolute agreement rates between self- and clinical-audits ranged from 50 percent to 100 percent. Four of the six PROs measured by the researchers were considered statistically valid, with suboptimal agreement indexes between the methods recorded for a patient’s ability to get out of bed independently, and their ability to go to the bathroom independently. Patient-reported usability of the platform was high, with only 13 percent requiring instruction. The patients completed 89 percent of the questionnaires provided by the app, with most reporting that it was “very helpful” and increased their motivation to recover following the procedure. The researchers noted that within their well-established ERP, patients often forget to use the paper-based education and diaries provided to them. Despite the study’s prospective design and a few other limitations, they concluded that the mobile-based engagement platform was well-received and provided largely valid assessments of perioperative recovery, and should be considered as an approach to improve patient satisfaction and reduce workloads in similar programs. “Future studies should investigate the use of mobile device apps as a strategy to increase adherence to ERP interventions and improve outcomes,” they wrote.